And Middleton should know. His residential design, Passive Butterfly won both the Single Dwelling (Alteration & Addition) and Best of the Best categories and combined both modern science and heritage features into one award-winning package. It was lauded by both the judges and the public for its aesthetic design, heritage features as well as its levels of sustainability. According to the entry notes, the driving force behind the ‘Passive Butterfly’ home was to create an exemplar for transforming heritage Australian homes into beautiful and super-efficient passive houses for the 21st century, whilst retaining the heritage aspects of the building. The design optimises spatial efficiency, while maintaining a compact footprint, generates more energy than it requires, and re-uses collected rainwater for toilets and the productive garden. In order to create the northern aspect, the extension was conceived as a butterfly roof pavilion, cleverly linked to the old building. Passive Butterfly is a prototype and exemplar in sustainable and holistic retrofits of heritage homes to exponentially improve their long term efficiency and lifespan. It showcases what is possible in terms of a holistic upgrade to Passive house standards. This project exceeds on all levels in terms of sustainability. Sustainable design is generally a term used to label buildings/architecture that improves on the previous status quo. Small incremental improvements that make a positive contribution to reducing the impact of what would have been in a BAU (Business as Usual) scenario. According to Middleton, the heritage home was retained, however existing windows were upgraded to triple glazed. Existing walls, floors, ceilings and roofs were also upgraded with new insulation to ensure air tightness. 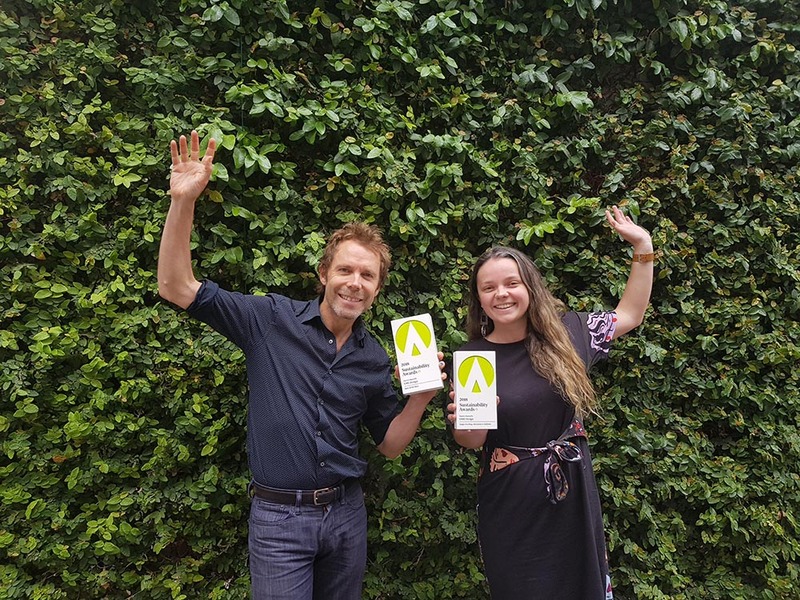 Bohemia Hookham with both of EME's 2018 Sustainability Awards. “It's doable, with the right approach, priorities and commitment,” he says. “Going one step further we aimed to also ensure the back garden was not overshadowed by the new pavilion structure,” says Middleton. Bohemia Hookham, (graduate of Architecture), accepting the Best of the Best Award at the 2018 Sustainability Awards, held, October 11, at The Star, Sydney. The result was an asymmetrical butterfly roof form. “The house has been designed with passive house principles; combine the two we have Passive Butterfly,” he says.